sparklyr is a new R front-end for Apache Spark, developed by the good people at RStudio. It offers much more functionality compared to the existing SparkR interface by Databricks, allowing both dplyr-based data transformations, as well as access to the machine learning libraries of both Spark and H2O Sparkling Water. Moreover, the latest RStudio IDE v1.0 now offers native support for managing Spark connections and viewing Spark context data in a dedicated tab. Although there are already lots of examples provided by RStudio, rather unsurprisingly almost all of them focus on using Spark in local mode (the billion NYC taxi trips analysis is an exception, but we’ll see later where it falls short as an example). So, I thought of getting the new package for a test drive on YARN, and here are my preliminary findings, hints, and tips. In what follows, we use sparklyr version 0.4, i.e. the latest stable version available in CRAN at the time of writing. 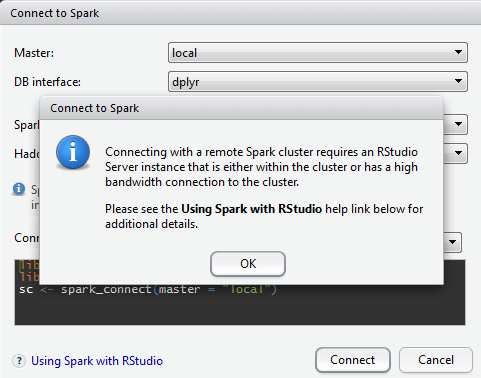 This means that, even if your machine is directly connected to the cluster, you still cannot use the connection functionality provided by RStudio Desktop. That said, truth is that in what follows I found little use of this functionality even with RStudio Server, ending up managing the connection in-script – and I cannot imagine that one cannot do the same from RStudio Desktop, provided that the machine has direct access to the cluster (not tested though). That’s great, only I want to also specify a number of executors. Of course, I cannot remember by heart all the different configuration arguments – what’s the documentation for? So, I went through the Spark 1.6.1 configuration documents, looking for the exact argument to use. I finally located it in some old Spark 1.5 documents – it is spark.executor.instances, with a default value of 2; it is a mystery to me why they chose not to include it in later versions of the documentation – but again, I have already argued elsewhere about puzzling and missing things in Spark docs. And, I am happy to report, it works like a charm. It is advisable that the definitions of the relevant environmental variables be included in the Renviron.site configuration file; while this sounds like a good idea for HADOOP_CONF_DIR and YARN_CONF_DIR, I prefer to have a more explicit and dynamic control of SPARK_HOME, since I maintain several different Spark versions in my cluster. Error: could not find function "copy_to"
This error puzzled me, and it took some time to figure it out; after all, copy_to is indeed a sparklyr function. which loads the Titanic data from an external Parquet file. while, curiously enough, in local mode the command works OK (I have opened an issue at Github). This is rather strange, as the error message suggests that Spark is looking for the file in the path hdfs:///home/ctsats/recsys/data/interactions_clean.csv, instead of the correct one hdfs:///user/ctsats/recsys/data/interactions_clean.csv. Although I could not reproduce this behavior with other files, it is maybe a good idea to include the full HDFS paths for your file references, just to be on the safe side.